The result of 15 minute’s rat-hunting in a French trench. Note the Jack Russell Terrier in the gentleman’s arms at left. The trench soldier of World War I had to cope with millions of rats. The omnipresent rats were attracted by the human waste of war – not simply sewage waste but also the bodies of men long forgotten who had been buried in the trenches and often reappeared after heavy rain or shelling. Two or three rats would always be found on a dead body. They usually went for the eyes first and then they burrowed their way right into the corpse. Trench conditions were ideal for rats. Some of these rats grew extremely large. It was not uncommon for rats to start gnawing on the bodies of wounded men who couldn’t defend themselves. Many troops were awakened by rats crawling across their faces. These rats became very bold and would attempt to take food from the pockets of sleeping men. 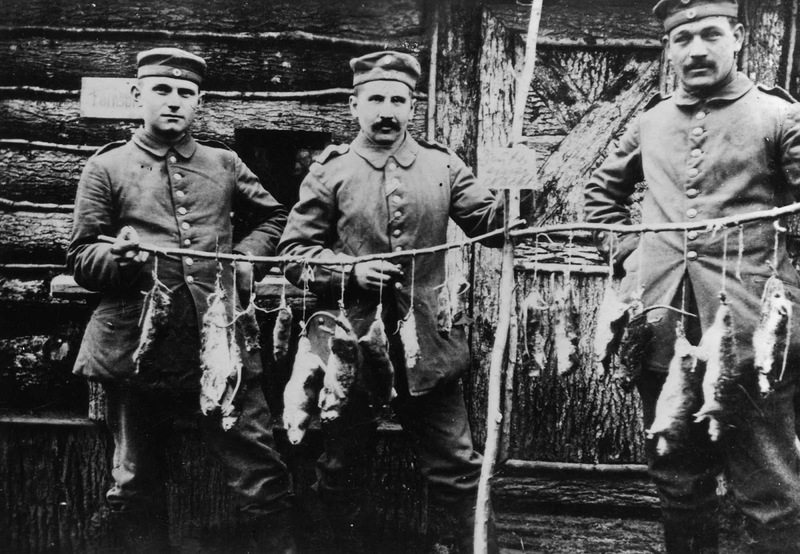 Disgusted and often feeling a horror of their presence, soldiers would devise various means of dealing with the rat problem. Although shooting at rats was strictly prohibited – it being regarded as a pointless waste of ammunition – many soldiers nevertheless took pot shots at nearby rats in this manner. Attacking rats with bayonets was also common. But efforts to eliminate them proved futile. A single rat couple could produce up to 900 offspring a year. Cats and terriers were kept by soldiers in the frontline trenches to help free them of disease-carrying rats. 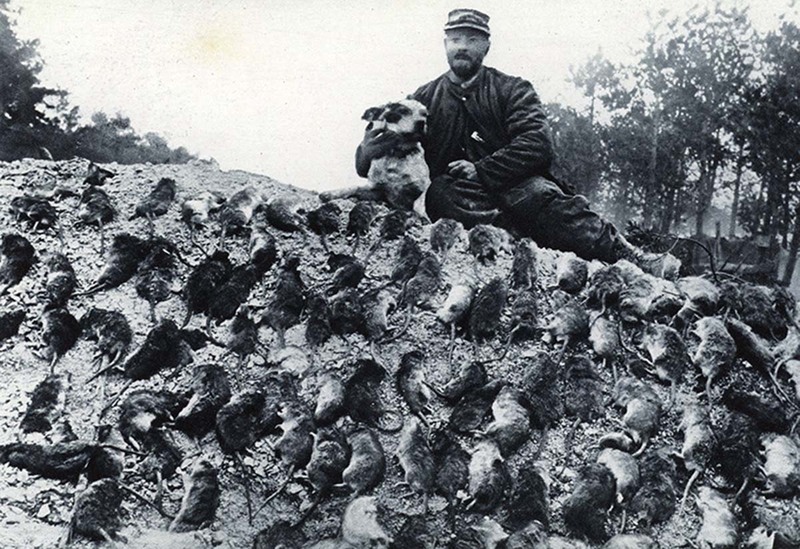 The terriers were actually very effective in killing rats. There is difference between a cat and a terrier when it comes to rodent control. When it comes to cats, even the best mousers only go after one at a time, and they often pause to eat. Generally it can take them days/weeks to deal with an infestation because of this. With a good terrier, they will take care of your rat issues in a matter of hours. They don’t stop to eat. They kill, then move on immediately to the next creature. They don’t play with their prey like cats do. They kill immediately. One terrier will also be much harder for rats to overwhelm as well. They are bigger and stronger than a cat, and their jaws are much bigger. That’s what they were bred, to kill rats. The plague of rats in the French trenches. An official rat-catcher, with his dog, and their bag. Illustration for The Illustrated War News, February 1916. Rats on German trenches. 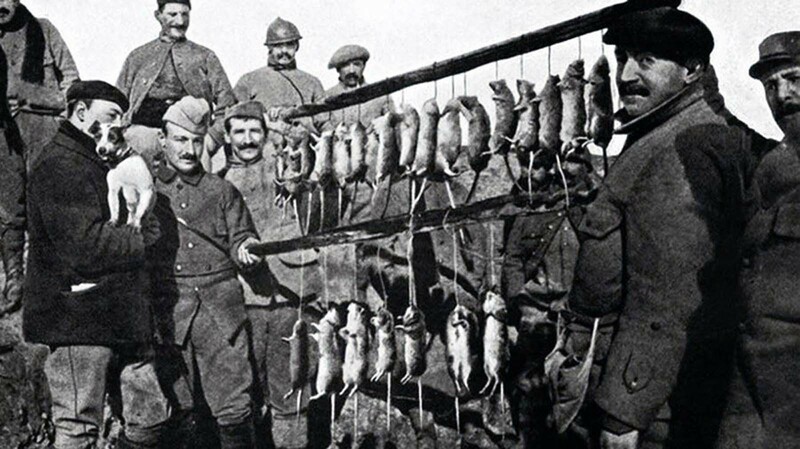 The rat problem remained for the duration of the war (although many veteran soldiers swore that rats sensed impending heavy enemy shellfire and consequently disappeared from view). 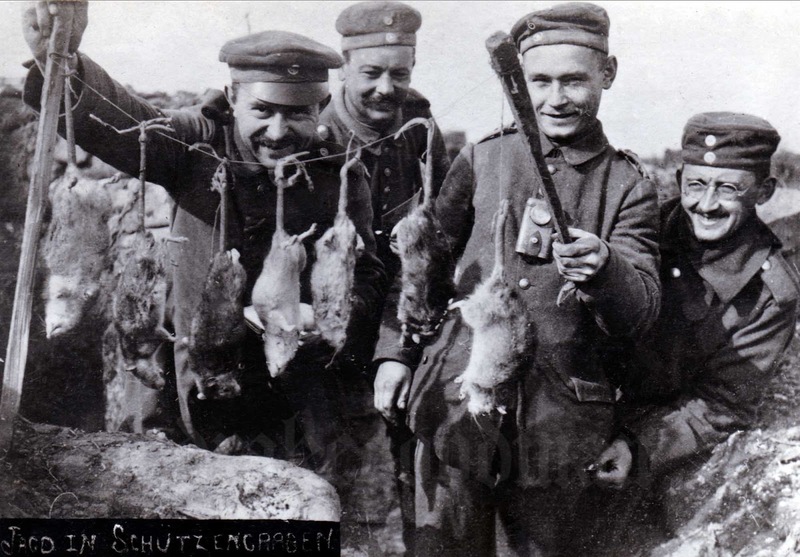 Two German soldiers posing with rats caught in their trench. 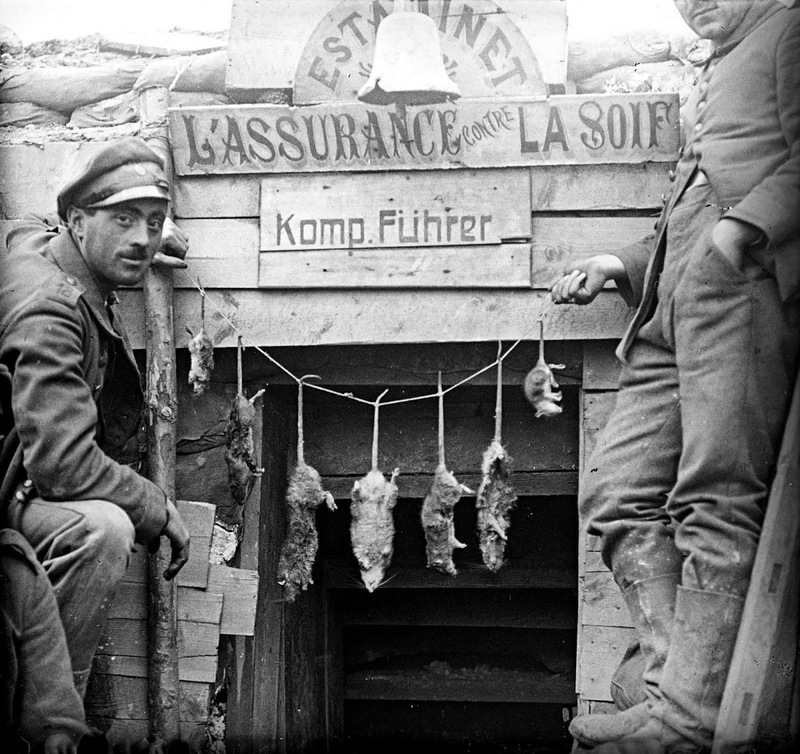 Three German soldiers display rats killed in their trench the previous night. 1916. 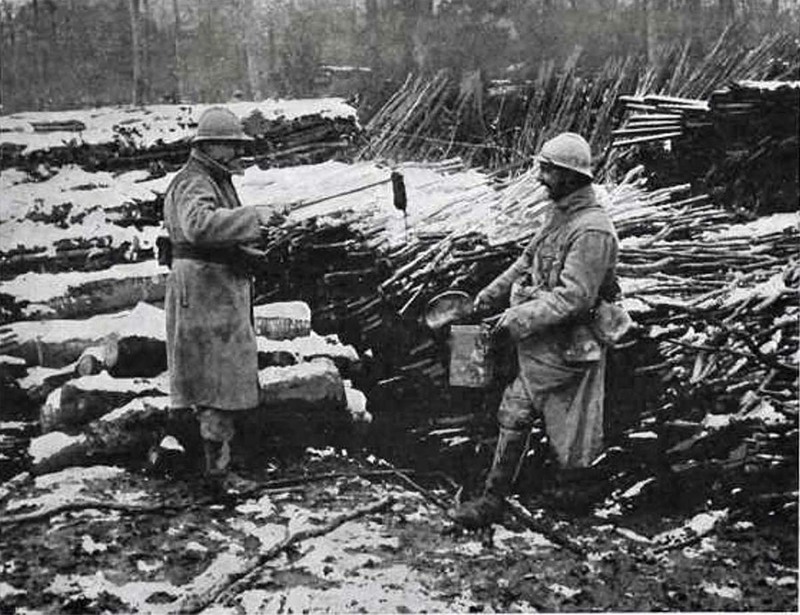 A French soldier showing his “catch” to his comrade. “Large feast of rat goulash today”. 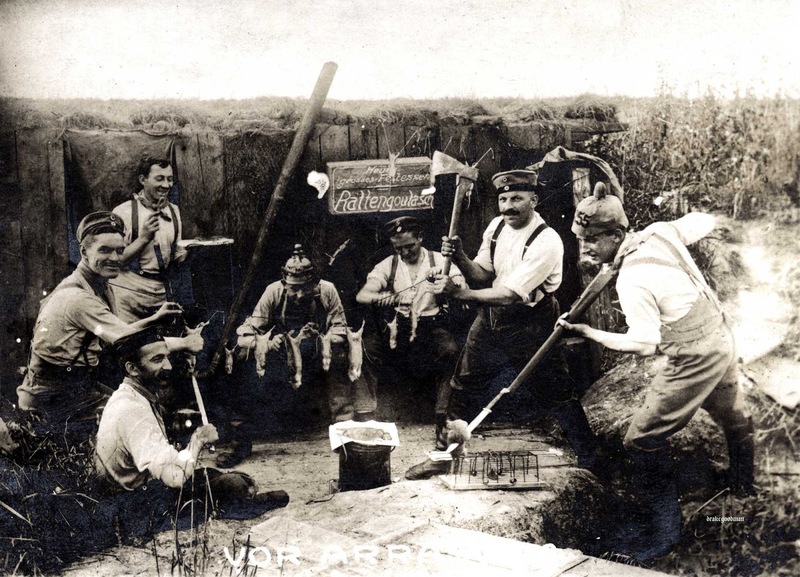 A commercial card depicting German artillerymen preparing several dead rats and one hapless mouse (or a skittish rat) for their evening repast – and who said Germans don’t have a sense of humor. “No sign of a lack of meat here”. 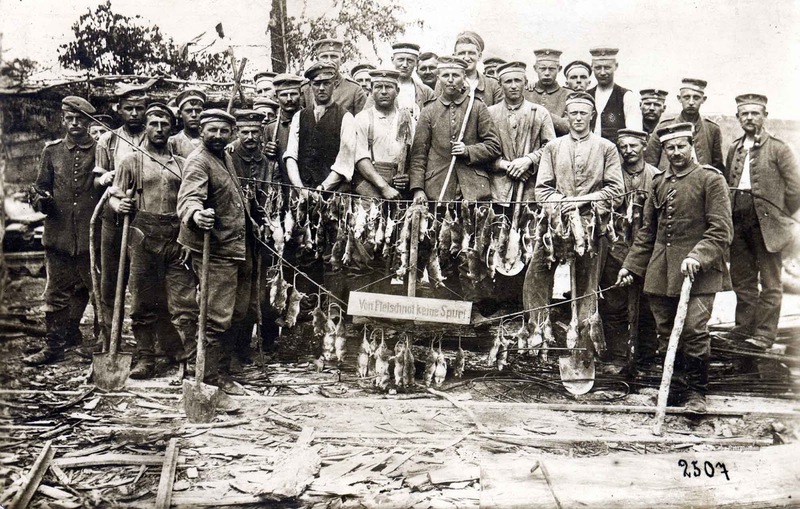 Another commercial postcard depicting the end result of a few hours hunting rats in the trenches and dugouts. Some of the men are toting shovels and improvised clubs, undoubtedly the weapons of choice in this particular ‘Rattenjagd’. Richard Beasley, interviewed in 1993: “If you left your food the rats would soon grab it. Those rats were fearless. Sometimes we would shoot the filthy swines. But you would be put on a charge for wasting ammo, if the sergeant caught you”. Most terrier breeds were developed in Great Britain and Ireland. They were used to control rats, rabbits, and foxes both over and under the ground. Some larger terriers were also used to hunt badgers. In fact, the word terrier comes from the Middle French terre, derived from the Latin terra, meaning earth. Terrier is also the modern French for “burrow”. I can attest that terriers are the best at killing vermin, using a quick snap to the neck and a full body shake to break the neck. My two Yorkies are studdingly beautiful, but, will kill vermin and leave it where it was killed. If it screams when one catches it, he'll do two shakes and then drop it. They never eat the verim, they are too well fed on home made dog food. The house next door to me is abandoned, and my two are constantly stalking the peremeter, searching and guarding, occasionally finding field mice and rats, moles and whatever is around that house,or yard; this keeps the population from spilling into my property. My two georgeous dogs can hold their own chasing and catching rabbits in our garden as well. My older dog freezes in place when he sees vermin, going to a pointer position and waiting for me to signal "get em." I've often thought I could hire them out as they love searching for vermin - all i want to do is brush their teeth and ensure they didn't pick up any fleas or ticks from the kill.